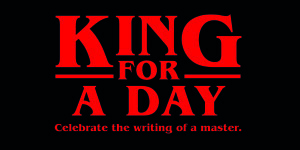 Home > Uncategorized > Celebrate the writing of a master and be King For A Day…. Whether you are already a fan or have yet to read a story by Stephen King, we welcome you to join the celebrations and wear the reading crown. If you are a fan, why not recommend your favourite book to a friend? If you have yet to read a King book, why not start with one of the following titles? We’ve selected 8 books which show the diverse range of King’s writing – from his first-rate non-fiction book On Writing through Classics IT, The Shining and Misery to his most recent collection The Bazaar of Bad Dreams. 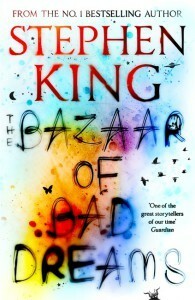 The Bazaar of Bad Dreams is a wonderful introduction to the world of Stephen King – offering a range of stories to suit you. If you are in the mood for a story in which a dog will pull at your heartstrings try ‘End of Summer’ and if you want to be uplifted with a gloriously witty tale of a neighbourly firework contest which gets out of hand read ‘Drunken Fireworks’. If you prefer to listen to the stories, don’t miss the exciting activity running on Audible this September. 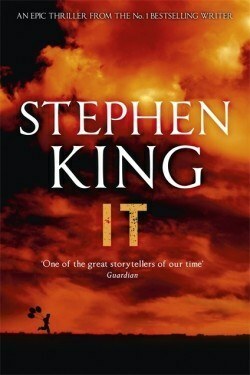 Stephen King is one of the world’s bestselling writers ever and there is a very good reason for that: he writes stories that draw you in and are impossible to put down. As Lee Child says, he is ‘one of America’s greatest living writers’. In September of 1974, Stephen King and his wife spent a night at a grand old hotel in Estes Park, Colorado: the Stanley. They were the only guests; the hotel was being closed down for winter the next day. They were shown to Room 217…That night King dreamed of his three-year-old son running through the long empty corridors, chased by a fire-hose. He woke with ‘a tremendous jerk’ and sat in the chair looking out the window at the Rockies. By the time he’d smoked a cigarette ‘the bones of the book were firmly set’ in his mind. Set in the majestic Rocky Mountains, the Overlook Hotel boasts one of the most beautiful settings in the world. Except in winter – when it is cut off from civilization from months. Off- season it is a place full of ghosts. When Jack Torrance lands the job as winter caretaker, he sees it as a chance to get back up on his feet, to overcome his urge to drink, and to write his play. As a family man, he brings his wife Wendy and his five-year-old son Danny with him. It’s an opportunity for the family to save itself. There is a very good reason why Stephen King is one of the bestselling writers in the world, and why his books are as popular today as when they were first written. He is an author whose suspense stories have become Classics in his own lifetime, read and re-read by each new generation. Don’t miss his other iconic chillers, and download our reading group guide here. 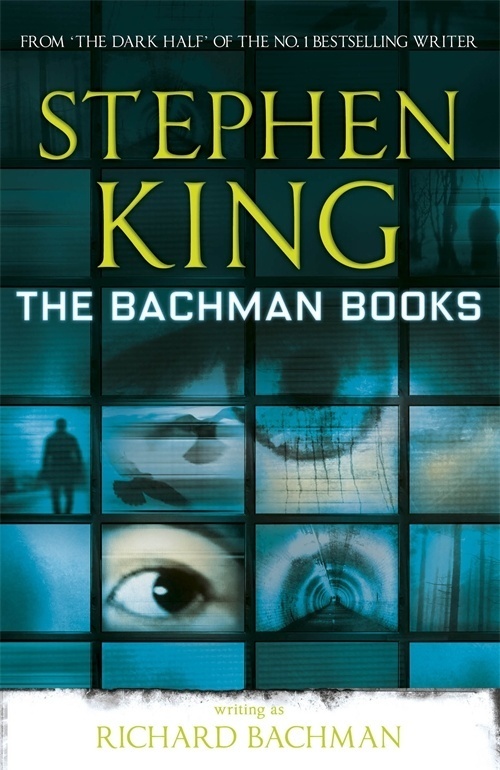 Why did Stephen King choose the pseudonym Richard Bachman? When his publisher asked him to come up with a name on the spot, Steve was listening to a track by Bachman-Turner Overdrive. There was also a novel by Richard Stark on his desk – which was ‘kind of funny because Richard Stark is in itself a pen name for Donald Westlake’ – and he put the two names together. 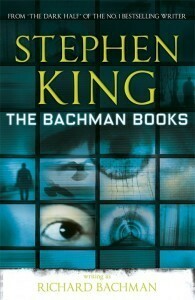 For years, readers wrote asking if Richard Bachman was really world-bestselling Stephen King writing under another name. Now the secret is out – and so, brought together in one volume, are these three spellbinding stories of future shock and suspense. The Long Walk: Welcome to an ultra-conservative America of the future where the cream of the nation’s youth sets off on a gruelling 450-mile marathon. It’s the ultimate sports competition where a single misstep could be the last. In his fascinating introduction to The Bachman Books entitled Why I Was Bachman, King explains how, back in the early days of his career, publishers felt that one book a year was all the public would accept. As a result, he wrote a number of books under this pseudonym, even creating a fictitious biography and photograph for Richard Bachman. King was rumbled by a Washington book clerk – King’s style, his unique ‘fingerprint’, shone through. The secret was out but two further books by Bachman, The Regulators and Blaze, were to surface after Bachman had died of ‘cancer of the pseudonym’ in 1985. In 1978, Steve set out on foot to collect his mended car from a Colorado dealership some three miles away. He was wearing cowboy boots which sounded like a hollow clock as he crossed a bridge. It made him think of the fairy tale called The Three Billy Goats Gruff and he wondered what he would do if a troll called out from beneath him: ‘Who is trip-trapping upon my bridge?’. Suddenly, he wanted to write a novel about a real troll under a real bridge. The bridge became a symbol – a point of passing from childhood to adulthood. And in the summer of 1981, King decided he ‘had to write about the troll under the bridge or leave him – IT – forever’. IT was a chance for him to write a long book about monsters: vampire, werewolf, mummy and one creature that makes children scream most – the clown! 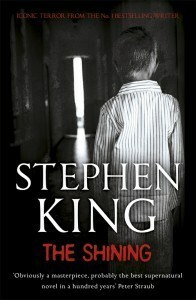 King has written several other stories about children and group of children, including ‘The Body’ in Different Seasons which was turned into the film Stand By Me. And he has often written about the fundamental difference between children and adults. Noticing there were books written about children for children and the YA audience, but few about children for adults, he hoped that IT would create a fictional bridge, giving adults a chance to relive their childhoods. IT explores how kids have a ‘wider bandwidth’ when it comes to perception, while the ‘field of vision’ tends to close down when we become grownup. The small town of Derry is the setting for several of King’s novels including Insomnia, Dreamcatcher and part of 11.22.63. IT is one of King’s excellent epic thrillers. 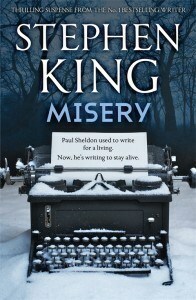 The inspiration for Misery was a short story by Evelyn Waugh called ‘The Man Who Loved Dickens’. It came to Stephen as he dozed off while on a flight from New York to London in the 1980s. He dreamed about ‘a popular writer who fell into the clutches of a psychotic fan living on a farm somewhere out in the back of beyond. The fan was a woman isolated by her growing paranoia. She kept some livestock in the barn, including her pet pig, Misery’…The writer’s efforts to play ‘Scheherazade and save his life’ gave Steve ‘a chance to say some things about the redemptive power of writing’. The title was inspired by a poem in Stephen King’s childhood. Late last night and the night before, Tommyknockers, Tommyknockers, knocking at the door. I want to go out, don’t know if I can, ’cause I’m so afraid of the Tommyknocker man. King first had the idea to write a forties-style science fiction novel about somebody stumbling over a flying saucer when he was at college, but found the canvas too big and quit. The idea recurred years later, and the novel became a powerful metaphor for drugs and alcohol. As Steve describes in his book On Writing he has many interests, but only a few ‘deep enough to power novels’. One of these is ‘how difficult it is – perhaps impossible! – to close Pandora’s technobox once it’s open’. He explores this in The Tommyknockers, The Stand and Firestarter. Under the Dome also draws on powerful science-fiction tropes. 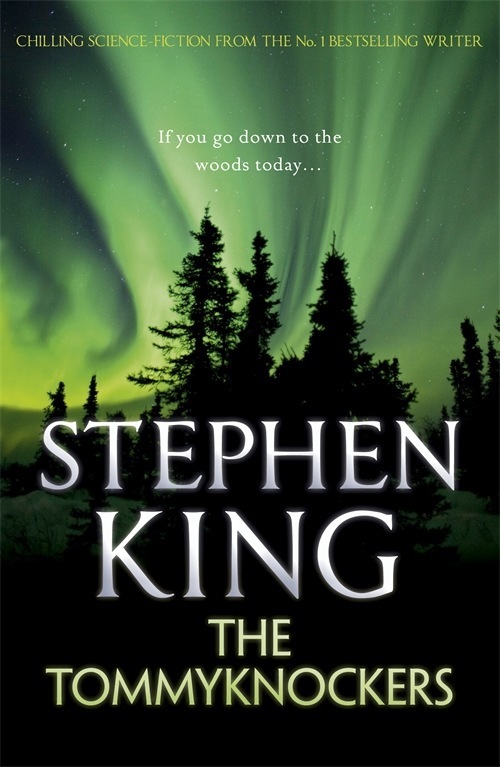 As with The Tommyknockers, King also started writing the epic Under the Dome years before it was published. Under the Dome began life as a story called The Cannibals. The Rock Bottom Remainders was a band comprised of writers, including Stephen King and Amy Tan. One night before a gig, Steve asked Amy whether there was ‘one question she was never asked at a talk’. Amy said: ‘No one ever talks about the language’. Steve had been playing with the idea of writing a book about the art and craft of telling stories on paper, and this was the moment he decided that, as a popular writer who had sold so many copies of his fiction, he ‘must have something worthwhile to say about writing’. Part memoir, part masterclass by one of the bestselling authors of all time, this superb volume is a revealing and practical view of the writer’s craft, comprising the basic tools of the trade every writer must have. King’s advice is grounded in vivid memories from childhood and his first experiences of writing, from his struggling early career to his widely reported, near-fatal accident in 1999 – and how the inextricable link between writing and living spurred his recovery. On Writing has become one of the most successful books for aspiring writers, and published authors, of all time. It is also a wonderful memoir about King’s childhood. Readers are frequently fascinated by the inspiration behind each of his books. In 1981, King also published Danse Macabre which was inspired by a telephone call he received from his US editor shortly after Halloween:. ‘Why don’t you do a book about the entire horror phenomenon as you see it? Books, movies, radio, TV, the whole thing.’ Discover more of King’s non-fiction. 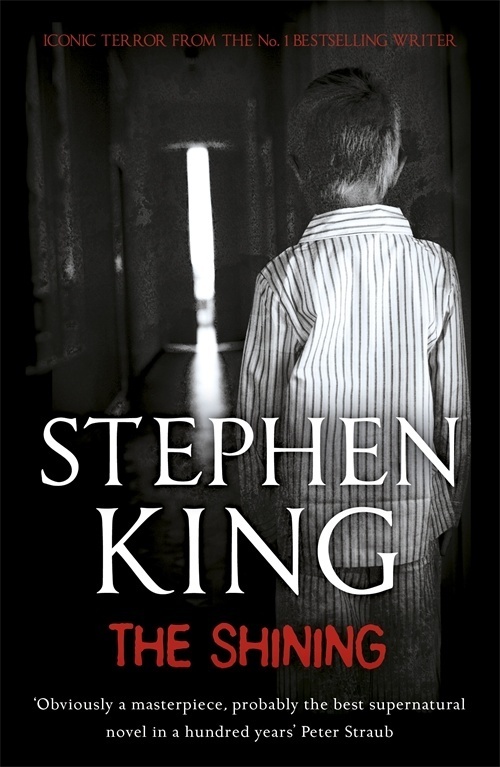 Stephen King began to get an idea for his novel Duma Key when he was out for a stroll in Florida around dusk, a spooky time of day on the coast. The road was overgrown with palms and rhododendron. As he rounded the corner, he saw a sign reading: Caution: Children. Stephen started to imagine twin dead girls with their hands linked. At that time, he was still in pain from the injuries caused by a van running into him. The image stayed with him for years. Duma Key is about a guy named Edgar Freemantle who has an accident and loses an arm; intrigued by this, Stephen King did a lot of research into phantom limb syndrome. These were the two background triggers for Duma Key. When Edgar Freemantle moves to Duma Key to escape his past, he doesn’t expect to find much there. Edgar Freemantle begins to paint. And as he paints, Duma Key’s secrets begin to stir. Secrets of children lost in the undertow, of a ghost ship riding the distant horizon – and a family’s buried past reaching long arms into the present. 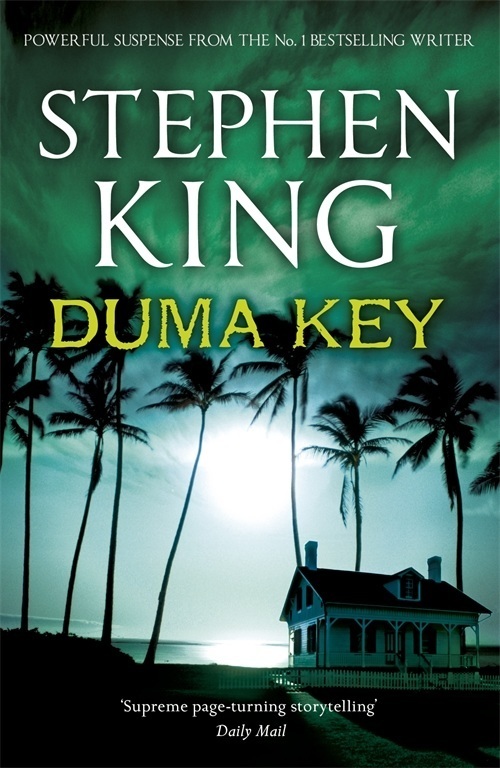 Duma Key, along with Lisey’s Story and 11.22.63, are among those novels of King’s most highly acclaimed by literary reviewers. These novels are a perfect choice for Reading Group discussions. As with ‘The Dune’ from The Bazaar of Bad Dreams, Duma Key is set in Florida. 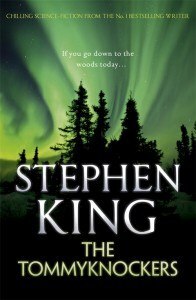 As King says in the introduction to this story collection, he writes short stories because he ‘was born to entertain…There’s something to be said for a shorter, more intense experience. It can be invigorating, sometimes even shocking, like…a beautiful curio for sale laid out on a cheap blanket at a street bazaar.’ Each story in The Bazaar of Bad Dreams is also introduced by Stephen King with a revelatory piece on what inspired him to write it. There is a treasure here for every reader: a man who keeps reliving exactly the same life, repeating his mistakes over and over again; a columnist who kills people by writing their obituaries; a poignant tale about the end of the human race and another of a firework competition between neighbours which reaches an explosive climax. 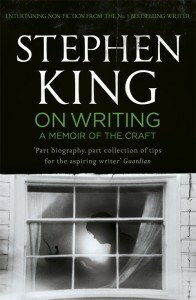 ‘Short stories have a famous place in the King oeuvre, with the likes of The Body and Rita Hayworth and Shawshank Redemption finding second lives on the big screen as Stand By Me and The Shawshank Redemption… Like all the greats, though, his ability to grip the reader’s mind, body and soul with his prose makes it all look easy’ – USA Today Don’t miss King’s wonderful collections. A constant reader for the last 25 years, I’ve read almost everything now and what a fantastical, chilling, tearful, funny, heartwarming, informative and entertaining ride it’s been. I started with Different Seasons when I was about 12 and couldn’t put it down. Stephen king has the uncanny ability of snaring you within the first paragraph and not letting you go. I love that there seems to be something bigger in the background connecting everything. Long may he continue. and long we will continue to love his work. From just another constant reader.